Since our pioneering days in 1948, Hydra-Electric has been a consistent leader in designing and manufacturing the next technological developments in sensors and switches for the aerospace industry. 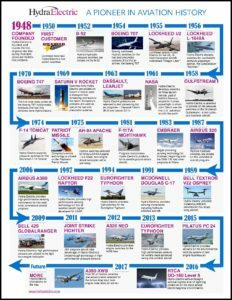 Our timeline captures a few highlights over the years of our many successful aviation partnerships. This entry was posted in Aerospace General Interest, Aerospace Switches, Aircraft Sensor Design, Aviation History, Sensor technology and tagged aerospace engineering, aerospace industry history, aerospace sensors, aerospace switches, aircraft sensor design, aviation history, Hydra-Electric catalog, Hydra-Electric history, Hydra-Electric products, Hydra-Electric sensors, Hydra-Electric switches, Hydra-Electric timeline, Transducers. Bookmark the permalink.